In your non-fiction, and more recently, in your poetry, you have written about the politics of grief and subtly, about a country of grief. It suggests a zone that is almost beyond language or where language does not suffice, a zone where numbers certainly do not suffice and yet are desperately craved, by the uncounted. It was only a year after your debut novel came out that the 2009 surrender of the LTTE (Tamil Tigers) to government forces created its own country of grief, one where the number of dead or missing remained uncounted. You wrote poignantly in the 2011 issue of Granta on how a commitment to grieving is a commitment to truthfulness: “My words must re-enact and contain not only the deaths and my grief, but also their negation.” The complexity of negotiating literary truth in a world where fact itself is a kind of fiction comes to mind. In your work, one senses the inadequacy of memory even as it attempts to witness, remember, or account for, as in your poem, Condolences (2011). How much is the search for language a part of your motivation and vision as a writer? Thanks for your kind attention to my work! I appreciate the thoughtful reading. I do hope my work illuminates, humanizes, and complicates the histories it addresses. Certainly, the policing of mourning is an issue for communities and especially minority communities in Sri Lanka. I am writing for these communities—not on their behalf, I want to say, but in solidarity with them, as much as I can. I also want to remain open to any critique, and especially from them. I have also come to realize that my desire to complicate history and binary political narratives manifests sometimes in a complication of form. You refer to “We Regret To Inform You That Your Condolences Cannot Be Accepted At This Time” as a poem; I wrote it thinking of it as a short story; others read it as an essay, although I had hoped to mark it clearly as having a fictional we. What does it mean to mark something through genre? Is it important? This is connected to claims on grief. I am interested in inverting and subverting bureaucratic and inhuman forms, I suppose, to make room for what is human and messy. Your work has been conscious of the violence of Orwellian language, the constant barrage of tongue twisters, whether it be the language of international institutions, disaster management, tourism, terrorism or “peace” (camouflaged in nationalist or religious doublespeak). Your 2014 poem, Tongue Twisters, is an incredibly powerful example, where you look at the intersections of tourism, environmental damage and the humiliation of a surrendered population, at the complicities and immunities that render the latter invisible and more completely subjugated. As a diasporic writer, do you feel you are able to overcome the alienating effects of your positionality vis-à-vis such a population, whether it be the institutions or languages associated with that position? The writing has to stand for itself. When people read me, hopefully they see me operating in good faith and being attentive and open. I don’t think there’s much more that I can do about that, other than to be as precise and honest as possible. I have very limited control over anything else. I do have complicated feelings about institutions and language; for me, English is a Tamil language, and my personal English is heavily influenced by Tamil. I have also followed the politicised history of language in Sri Lanka. I have been excited to see some translations of my work floating around, and that recently prompted me to apply to my own institution, the University of Minnesota, for support to translate some writing into Sinhala and Tamil. I’d like to be in dialogue with more people. I do not write in Tamil, but I do study it, and can read a little bit. I’ll keep working on this. Are you hopeful about forging lines of flight between binaries, and/or homogenizing tendencies in the region? Your focus on Sri Lanka and South Asia has been unwavering (you were vice president of SAJA). How has your commitment to Sri Lanka shaped or transformed your commitment to the region as a diasporic, political writer and do you feel that regional literary solidarities/networks/happenings have a significant role in overcoming homogenous identities, or do you feel they tend to superimpose power structures over the ground, replicating without allowing new forces/voices/generations to come to the surface? In other words, are these creative or reproductive? I’m still figuring out what I think about this, but South Asia as a term has been helpful to me. It makes me feel in community with more people, and undermines majoritarian thinking in some aspects. It runs counter to many forms of nationalism, too. Of course, it’s not a problem-free term, but for me it’s a beginning. It has also brought me into conversation with writers and reading I might not otherwise have found, and which have been important to me. I have a hard time with the dominance of the nation-state as a lens for literature, perhaps because I have become somewhat transnational in my interests. And maybe that’s connected to my place in a really scattered diaspora. The Sri Lankans I love are in Sri Lanka, the United States, Canada, England, France, India, Australia, Germany, and other places, and their communities are wonderfully different from each other. This question is somewhat connected to the previous one. It has become apparent to me that many people assume someone from a diasporic position cannot or will not extend themselves to understand those living in Lanka. While of course I don’t think my understanding can be perfect, it does seem to me that I can substantially expand it by doing certain kinds of work. I’d like to see how far I can take that. I like a good dare. To be honest, I don’t think about this much, at least not consciously; I suspect doing so might prevent me from actually doing it. But I would be remiss if I did not say that I have been aided at various points by timely solicitations from editor friends, including, notably, Sanjana Hattotuwa of Groundviews, as well as the editors of Granta. And when I am working to meet deadlines of that kind, I often turn to the news—even the very recent news—for ideas. The effect of the news on my novel is probably less obvious. But in my poetry and shorter fiction it’s fairly plain. That said, I have always written shorter work of this kind, even when I wasn’t publishing it, so what may appear to be a new interest isn’t, exactly. But Twitter and other online publications have definitely provided welcome outlets. And the real-time feel of responses gives me a different kind of energy. To continue with Love Marriage, then, what kind of research did you have to do in order to write about a Canadian-Tamil family, especially a Canadian one? Regarding Canada—I went there frequently as a child and loved it. I will note that although I did do research to write about Sri Lankan Tamils in Canada, the family I write about in Love Marriage is a family of Americans who travel to Canada—they are not themselves Canadian. So I felt like I was doing a reasonable job of portraying them, given a combination of what I knew from experience and what I was able to find through research. Fortunately, research *is* my comfort zone! I love doing it. Are you envisioning a book of poetry, more fiction, something altogether new and hybrid, or are there other projects you are envisioning? I know you have continued to freelance. If this is not something you want to share now—then, which writers inform your work these days, and has it changed in this last decade? I’m at work on a second novel, and do hope to assemble some poetry, nonfiction, and shorter fiction sometime. Though I had no idea when I was writing those things that they might comprise another book. 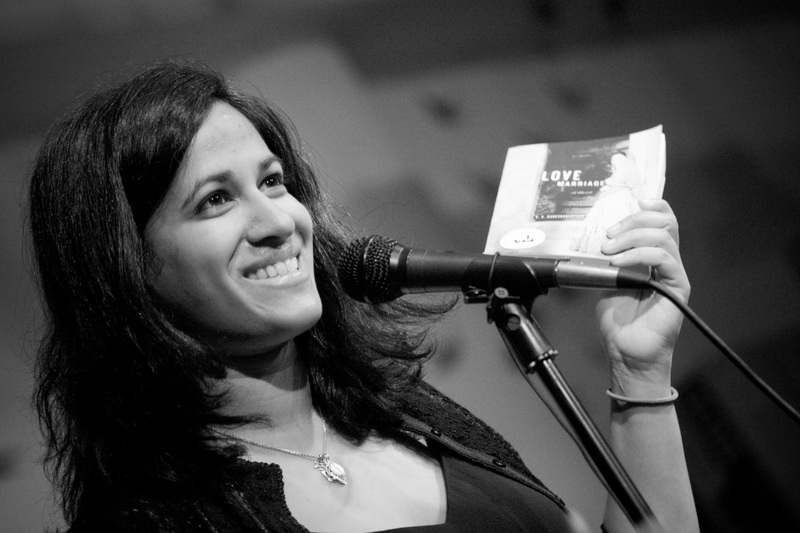 Seema Amin is a poet and writer, working on her MFA thesis on a hybrid novel and a collection of poetry at UBC. Her two books of verse were published by UPL (Dhaka); apart from poetry published in literary journals (Fulcrum, Cambridge, MA, and Six Seasons, Dhaka), she has published numerous articles on art, culture and politics as Senior Feature Writer of Depart, an art magazine, and as a columnist for the New Age and other dailies. She has worked in environmental and labour rights organisations, as well as taught, in Thailand, Bangladesh, Switzerland and England. Her undergraduate studies culminated with a Liberal Arts degree from Sarah Lawrence College in New York and Paris. She was born in Manitoba, grew up in Bangkok and is Bangladeshi by the ties that bind.